On Wednesday night I ended up running 18km, but when I was done I failed to re-fuel properly due to nausea. This continued to the following morning when I was still unable to eat enough. I headed out for my 70 minute run and became so hungry I couldn’t think about anything else. 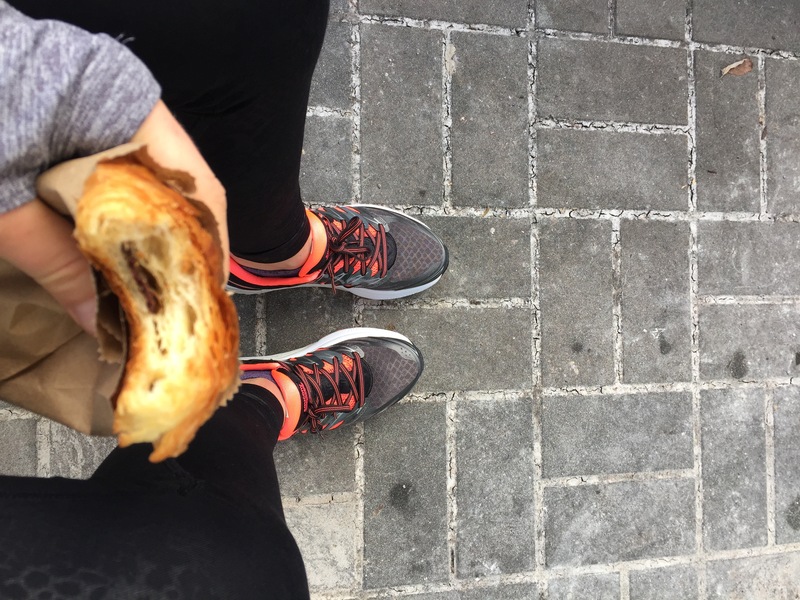 There happens to be a really good bakery on route also incidentally the only food on the route (lucky me), so after 7km I stopped, ate a pain au chocolat and proceeded to finish my run. I have never done anything like this before, but sometimes things happen and well, it was a freaking tasty stop. During 2XU Camp we had a presentation about nutrition by one of the resident dieticians at CSIO. This inspired me to make my own appointment with a dietician and see what she had to say about my specific fuelling needs for distance running. In January I will start training for the Eugene Marathon in May and in preparation for that I want to make sure I am eating as optimally as I can be. Before our appointment I was asked to fill in a 3 day food diary including the time of each intake and the amount of each item as precisely as possible, I also filled out an exercise diary to give her an idea of how much training I do. Going into this I felt that my eating habits were above average. I try and eat something every 3 hours, make sure to balance protein, carbs and fat, and drink lots and lots of water throughout the day. I am also very conscious of the types of foods I choose to eat and prefer natural foods to those with a long list of complicated ingredients. I met up with the dietician last Friday and she said on a bigger training day my caloric need would be about 2700 calories, I am by no means planning to count calories, this is just one guideline. It should be adjusted to be more or less depending on how much training I am doing. When I submitted my exercise calendar the longest run was 18km, so with marathon training that will increase to be much longer as will my fuelling needs. In terms of distribution, I am recommended to have 20 servings of carbohydrates, 12 of which should be grain, 5 fruit/sweet vegetables (squash for example), 3 milk alternatives (1/2 cup of chocolate milk is 1 serving). For protein, the target is 9 servings, an example of a serving is 1 large egg . For fats it is 3 servings per day, examples include: 1/6 of an avocado, or 1 tsp olive oil. I normally eat half an avocado at a time, which would be the total fat allowance for the day (oops). There are also “free foods” and the target is “as tolerated”, but aiming for 5 servings of free vegetables. Free vegetables include: cauliflower, kale, peppers, tomato, though there are many more. In addition, there are 2 “other foods” included in the day and those are higher-fat carbohydrate foods and one fat choice, for example a chocolate chip cookie or a glass of wine. This is all ideally divided between 3 meals and 2 snacks throughout the day, and there is a suggested distribution of these servings among those 5 eating times, but I won’t bore you with that. 1) Combining carbs with lean protein, and healthy fats will help keep blood sugar from rising too high AND keep you full longer. 2) Eat 3 meals a day about 4-6 hours apart. 3) If meals are more than 4 hours apart, have a snack between them. 4) Aim for variety and choose at least 3 out of the 4 food groups at each meal and at least 2 food groups at snacks. 5) 1-4 hours before exercise, consume at least 60 g of carbohydrates (4 servings), for example a nut butter sandwich and a piece of fruit. And hydrate! 6) During exercise lasting longer than 1 hour, aim for 30-60 g of carbohydrate per hour (I generally don’t fuel until the run is 90 minutes or longer). 7) During exercise lasting longer than 2.5 hours, you may benefit from up to 90 g of carbohydrates per hour. 8) Post exercise, aim for 1 g per kg of bodyweight in carbohydrates over the next 4-6 hours, 15-25 g of protein and fluid to re-hydrate. 9) If planning to be active the next day, have a snack within 30 minutes after your activity. 10) Improve iron intake by including at least one iron-rich food and one food rich in Vitamin C at each meal (it helps your body absorb more iron). Most of what the dietician mentioned were things I already knew. Like I said, I consider myself to be above average with my nutrition and that proved to be true. Upon her analysis of my eating habits, I am successful at meeting the needs she outlined. I do need to increase my iron intake which is not something to take lightly. I often eat oatmeal for breakfast because of the iron content, however I have a coffee with it which is not ideal for absorption. It is hard to imagine waking up and not having a coffee, especially at 5am, but I might have to switch to tea and have the coffee later in pursuit of increasing iron absorption!